When it comes to nutrition, it’s important to think of every member of your household, including your furry little friends. Unlike humans who require a variety of foods to achieve nutritional balance, a quality pet food contains everything your dog or cat needs. A shiny coat, bright eyes, abundant energy and good digestion all result from the right food. Proper food selection is based on the stage of your pet’s life. Puppies, kittens and young animals require extra protein, vitamin and minerals; an older less-active animal may benefit from a senior formula. Some foods, even though they meet legal definitions, may contain lesser quality ingredients, not providing your pet with necessary nutrition. 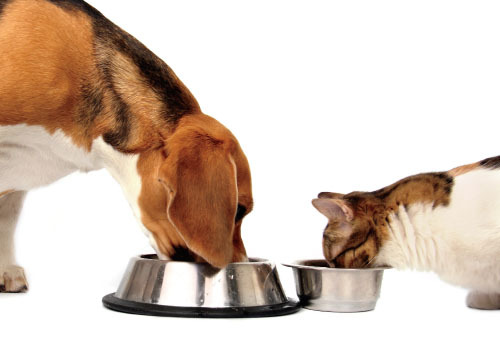 Pets should be fed at regular times and just enough to maintain a healthy weight. The urge to add flavor by supplementing with table scraps should be resisted. Not only does this interfere with a pet’s digestion, it will most certainly cause behavior issues. There is no food that will be the answer for every pet. Just as humans have unique issues requiring special diets, animals have distinct needs too. • Milk is not a substitute for water, and it may cause diarrhea. • Raw fish may cause a thiamine deficiency resulting in weakness and possible seizures. • Raw liver may cause vitamin A toxicity. • Raw meat may contain parasites and bacteria causing physical deformities. • Raw eggs may lead to skin and hair issues. • And, never give your pet chicken, pork or other meat with small bones. The bones are likely to splinter, causing mouth or throat damage. 1.Preheat oven to 350°. In large bowl, with mixer on medium speed, mix all ingredients except flour; gradually add flour and mix until incorporated. 2.On lightly floured surface, roll dough to ¼-inch thick. With about 3-inch cookie cutters, cut out cookies; transfer cookies to cookie sheets in single layer. Gather and roll scraps to cut out additional cookies. 3.Bake cookies 20 to 30 minutes; transfer to wire rack to cool completely. Store in an airtight container at room temperature for 1 week or refrigerate or freeze up to 3 months. DO NOT use sugar free peanut butter; some sugar free products contain xylitol, which can be deadly to dogs. For senior pets, bake cookies for the shorter time so the treats are softer and easier to chew. For younger pets, bake for the longer time so the treats are crunchy. This recipe is very versatile: you can substitute mashed bananas, unsweetened applesauce or sweet potato purée for the pumpkin.